There are a number of ways that a commercial structure can experience a settling foundation. The most common cause is due to the changes in the soils after construction of the structure has taken place. During drought conditions, the soil can dry and shrink causing settlement in structures. The Helical Pier System from Foundation Supportworks will permanently stabilize the structure's foundation and provide an opportunity to lift the structure back to level without the expense and disruption of a full foundation replacement. Rugged steel piers are mechanically screwed into the soil. 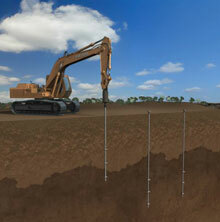 The piers are installed to appropriate depths and capacities, preventing any future settlement. Heavy-duty steel foundation brackets are connect to the helical piers and attached to the foundation's footing. The weight of the structure is then carefully transferred from the original unstable soils, through the piers, to competent soils or bedrock, ensuring permanent stabilization of your commercial structure and an opportunity to lift the structure back to level. 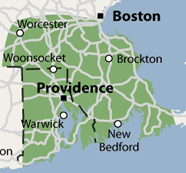 Foundation Supportworks provides free commercial foundation estimates in MA, and RI.